After a dismal and lacklustre season, Manchester United have had a dream transfer season. They managed to sign one of the most dynamic and determined managers of our time – Jose Mourinho – and he has managed to seal four perfect players in the transfer window. With their reputation and ego on the line as the world’s biggest club, does Manchester United finally have what it takes to get back to winning ways? They say that the foundation of a team is based on the manager, and they have that covered with Mourinho. He is aggressive, attack-minded and believes in getting the work done at the end of the day. This is the kind of spirit Manchester United lacked last season, and this time around, Mourinho would certainly do things a lot more differently and hopefully get better results. To give him fair credit, Mourinho did start off the campaign by making the right moves in the transfer window. He managed to sign Eric Bailly, Henrikh Mkhitaryan, Zlatan Ibrahimovich and – intense drumroll – Paul Pogba! With these new signings and the players from before, Mourinho would be able to rotate players more efficiently to find out the best pairings in each area. Also, since they didn’t qualify for the Champions League this season, they wouldn’t have to worry about over-playing the team, and can retain their focus set solely on winning the Premier League title. With the transfer window made full use of, let’s analyse the key fixtures that Mourinho would have to lay emphasis on winning. Old Trafford will host the Manchester Derby on September 10, which will see Jose Mourinho meet his old La Liga rival Pep Guardiola as the manager for Manchester City, before The Reds travel to Liverpool a month later on October 15. Mourinho will face his former club Chelsea at Old Trafford a week later and travel to Stamford Bridge in April. January will have the home league match against Liverpool before a potentially making or breaking time in February which includes City and Leicester away. Not to forget north London pair Arsenal and Tottenham, who finished second and third respectively last season. Mourinho extended a lot of power by bringing in quality players, but at the same time, that could mean that certain players at the United camp would need to pull their socks up. For example, Marcos Rojo and Memphis Depay are among those who have yet to fully prove themselves since arriving at Old Trafford. Mourinho is ruthless when it comes to putting together a team that wins, and rightfully so. Both Rojo and Depay will need to prove their worth if they see a future at Old Trafford. However, there can be a major con to whole situation that only seems to have pros so far. Mourinho might not hesitate to get rid of Juan Mata, or if not get rid of him, then maybe give him very less playing time or using him as a sub too often. Mata would definitely not like that and a lot of the fans want him to stay. Neither Mourinho nor Mata have mentioned anything so far, but will Mourinho manage to put aside his ego and retain Mata? There’s another player that has been bordering on the dark side and that is Bastian Schweinsteiger. He can be more focused this season and be less prone to injuries, and also, his experience in the midfield would be key and Mourinho is very well aware of that as he witnessed first-hand how Schweinsteiger decimated Real Madrid in the Champions League while he was still manager there. When it comes to players that are likely to shine, Paul Pogba cost a world record transfer fee and Zlatan Ibrahimovic was a free transfer, but both will definitely be key to any success United might have this year. Martial and Rashford also have unlimited potential to develop and Mourinho can nurture them to be the next big names at Old Trafford. This also finally means that United can have a quality attacking force as well, which is one thing they have been lacking since Sir Alex Ferguson’s departure. Valencia has had an average few years but he did manage to impress in the pre-season games and thus, he could be an unexpected bonus to a massively improved squad. However, the looming question over Wayne Rooney’s future at the team still seems uncertain, as last season’s performances proved that he is not quite comfortable in the midfield and not as quick as a striker. Another potential striker to watch out for would be Jesse Lingard as this could be his year after he made it two goals in two Wembley appearances at last weekend’s Community Shield final. Many have noted that Lingard’s work rate and speed make him a ‘Mourinho style’ player and this could be the year he becomes a United first team regular. After taking all that into consideration, it is no doubt that Manchester United have a lot at stake this season – they need to rebuild a strong team, prove critics wrong, rebuild the fans’ faith in them, figure out what to do with certain players, and also not risk their reputation for the third time around. At the same time, they also have Mourinho leading them and with the signings he has managed so far, and their performances at the pre-season games, this is just the start for the Red Devils. They are very likely to finish in the top 3 this season, and winning the league does not seem like a wild fantasy anymore. 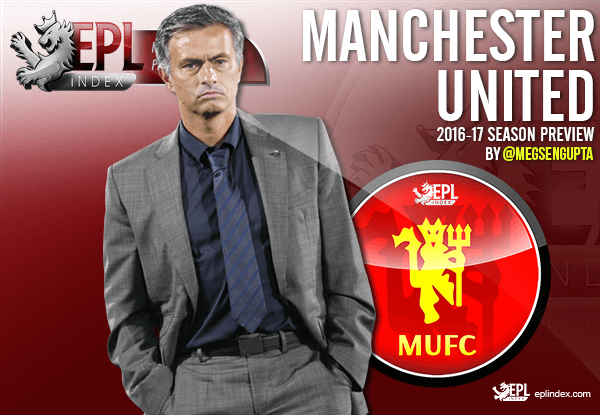 Categories: EPL Index Featured Article, EPL Index Opinion, Manchester United, and Manchester Utd (NN).' 'Tags: "Manchester United", Eric Bailly, Henrikh Mkhitaryan, Jose Mourinho, Juan Mata, Man Utd, Mata, Mourinho, MUFC, Schweinsteiger, and Zlatan Ibrahimovich.